Fabric Mart Fabricistas: Fit-Along Announcement! I'm so excited to announce a special collaboration between three amazing companies in the sewing industry! Fabric Mart, Palmer/Pletsch and McCall Pattern Company are coming together to bring you the Fabric Mart Fit-Along! This project has been in the works for a couple months and I think it's a great opportunity for beginning sewers, sewers that have never used the Palmer/Pletsch tissue fitting method or someone that wants to brush up on their pattern fitting skills. Melissa Watson, designer for McCall Pattern Company and a certified sewing instructor for Palmer/ Pletsch, & Julie Brown (me) Fabric Buyer and Wholesale Manager at Fabric Mart teamed up to take you through the steps of fitting a pattern on your body using the Palmer/Pletsch Tissue Fitting Method. In particular, we are focusing on how to fit patterns suitable for knits. (This is slightly different than tissue fitting patterns suitable for wovens.) 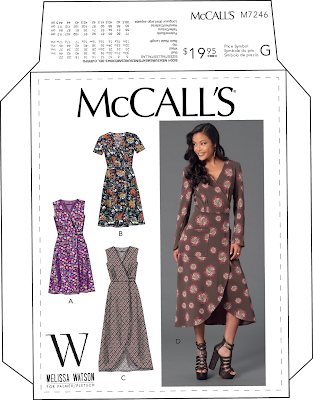 This method is the fastest and easiest way to get a great fit with your sewing patterns. Things you learn through these videos can be used in your other sewing projects, too. Learn all the details about the Fit-Along HERE. And, every Saturday in February 2016, we will introduce a new video until at the end we will have a finished garment. Melissa will be fitting McCall's 7246 on me (Julie) and then fabric fitting the garment on me. You will get to see the entire process from start to finish through this Fit-Along. 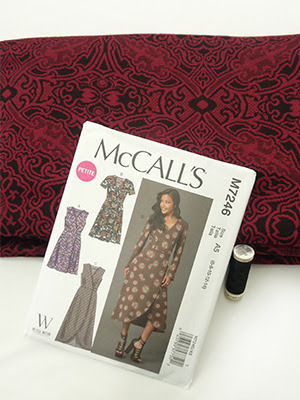 I will also be talking about fabric options for this pattern. We will also be selling fabric kits to go along with the video. The kits will include fabric used in the video so you can make your very own wrap dress. Plus, the first 50 sold will get a FREE sample of PerfectFuse interfacing. (Enough to use for your project.) Fabric kits are almost finished and will be available soon. We've released a trailer to get you inspired, check it out! And, every Saturday in February 2016, we will introduce a new video until at the end we will have a finished garment. We hope you will join in the fun! I am really excited about this fit-along, might have to grab this pattern and play along, and I love the tops the two of you are wearing! I love this pattern and this sounds like fun! Count me in! Excited about this excellent collaboration, great idea the fit along. Thanks ladies! Cant wait to have you tune in! Let us know if you have any questions along the way, we are happy to answer! I am excited about this. I love Melissa Watson and I have been watching for the first video. Since the first Saturday in February has come and gone, I hope I haven't missed it. I am not sure how to find the videos. If the first class has already aired is there a way to access it now? The first video is live and can be viewed here: http://www.fabricmartfabrics.com/Fit-Along.html You will be able to access these videos forever!